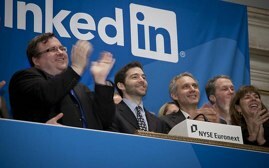 After opening to $83 per share and a market cap of $7.8 million, LinkedIn closed at $93.86 per share, giving the company a valuation of $8.9 billion. Although the professional social network priced at $45 per share, trading started at $83 (up 84 percent) and reached as high as $122.70 and as low as $80. Still, it’s hard not to note just how strong this IPO is compared to others that debuted this year. As we’ve written in the past, Chinese social networking company RenRen went public at $14 per share, but trading has dropped below this price. Attn Entrepreneurs: Mark Zuckerberg Isn’t the Role Model. Reid Hoffman Is.